...I've got a pounding headache. And I'll see you tomorrow. Headache Better today, but not gone. It's not migraine, fortunately. Just eyestrain I think. I don't know what made you think of that. Is this a bad place for me to practice drumming? I'd bet money it was a migraine. Any headache that is going to put you out of action is highly likely to be a migraine. Just sayin'. And I will be giving a presentation at work in a couple of weeks. I bet you can figure out what will be on my first slide. 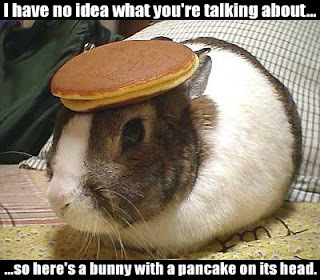 That bunny pancake thing is too funny. Oh -- hope you feel all the way better soon. I've decided to sell my glossy screen Macbook Pro, as much as I love it, for that reason. I'm going to switch to the non-glossy screen. Too much eye strain equals headaches. Muscle relaxers and good narcotics for a day. That's the ticket. Well, yeah, this is basically a straight up rip off of Shawn Powers' post from a while back. But you know that plagiarism is the sincerest form of flattery, right?